Washington (CNN)-Former U.S. 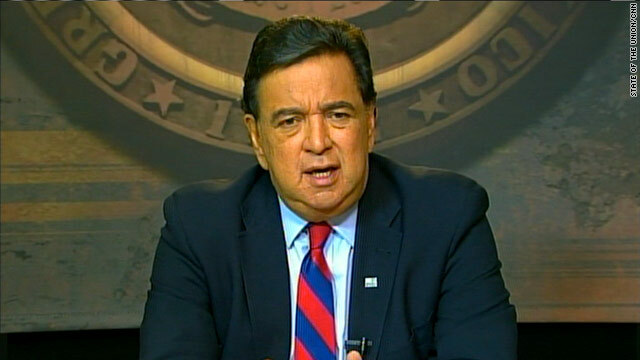 Ambassador to the United Nations Bill Richardson called for a no-fly zone over Libya during an interview Sunday on CNN's "State of the Union." Richardson made recommendations for next steps in handling the crisis in Libya, saying, "Next week is going to be crucial and the most important step is the development of an internationally recognized no-fly zone." While speaking with CNN Chief Political Correspondent Candy Crowley, Richardson, who also served as governor of New Mexico, praised President Obama for his treatment of the situation in Libya thus far. "The president has handled this crisis well," he said, adding that "His statement two days ago that Gadhafi must go lays the cornerstone as policy." Richardson made recommendations for that policy. "What I think the U.S. Needs to do is, one, covertly arm the rebels. We should take that step. Develop a no-fly zone." "Some kind of no-fly zone is going to be necessary mainly to send a message to Libya's military and Gadhafi that the U.S. and international community is not with them," he continued. "Protect those refugees." He echoed an idea voiced on "State of the Union" by Stephen Hadley, former national security adviser for President George W. Bush, saying, "I like that idea of Steve Hadley's of establishing trust, a financial trust, that develops those democratic reforms in Libya. Get in there early." Richardson also looked to the future: "There's huge opportunities for American foreign policy in the Middle East to be associated with democratic institutions, with those protestors that want democracy and equal rights, , for us to be on the right side." "But the next week is going to be crucial and the most important step, I believe, is the development of an internationally recognized no-fly zone." However, the White House downplayed calls for a no-fly zone or other military action. In an appearance on NBC's "Meet the Press," Chief of Staff Bill Daley said, "They talk about it like it's a game or a video game or something." "When people comment on military action, most of them have no idea what they're talking about," he said. Republican Minnesota Rep. Michele Bachmann agreed, saying on the same program that the president should listen to U.S. military leaders in deciding possible military steps to take in Libya. Last week, Defense Secretary Robert Gates said the military was ready to work with allies in implementing a no-fly zone over Libya, but he warned such a move would begin with attacks on Libya's anti-aircraft capabilities. President Barack Obama, in response to questions about the U.S. response in Libya, told reporters on Thursday that it was important to ensure that the Libyan people feel "full ownership" for any transformation and cited Egypt's recent revolution as an example. "We did not see anti-American sentiment arising out of that movement in Egypt precisely because they felt that we hadn't tried to engineer or impose a particular outcome, but rather they owned it," Obama said. Rigth on Anthony. Let the United Nations security council deal with it not the US. It's a good idea to protect Libyan's from Gadhafi, but let the UN mobilize forces to implement it and not the US, this way US is not viewed by the international community directly interfevening in Libya's internal affairs just like it did in Egypt. Isn't that a healthier foreign policy? Richardson said "US and international community", isn't that UN? Clearly, UN is not US and vice versa, no? We are not the Worlds police. Let Libya determine its own self. If NATO members support a no-fly zone in Libya, then the U.S. must be part of that action. Otherwise, Libya's internal unrest is none of our business. Libya has not invaded another nation or taken any other action that justifies unilateral action by the U.S. We are NOT the world's police department. Invading Iraq for no just reason has cost us a fortune and left that nation divided and suffering from so much destruction of their infrastructure. And for what? Oil! No one is suggesting U.S. action in Tunisia! Guess why? There's NO OIL there! Anybody remember a "note" that GWB supposedly received just before 9/11? Not saying it was ever proven, but wasn't disproven either. Pres. Obama has handled other situations quite well-am sure he will do the same with Libya.